Synopsis (borrowed from NetGalley): Allison Glenn tried to hide what happened that night…and failed. When Allison Glenn is sent to prison for a heinous crime, she leaves behind her reputation as Linden Falls’s golden girl forever. Her parents deny the existence of their once-perfect child. Her former friends exult in her downfall. Her sister, Brynn, faces the whispered rumors every day in the hallways of their small Iowa high school. It’s Brynn—shy, quiet Brynn—who carries the burden of what really happened that night. All she wants is to forget Allison and the past that haunts her. My Thoughts and Opinion: Could not put this book down!!! One fateful night, five years ago, a secret of a sixteen year old, many lives of those associated with her will change. This story follows four of the women that are most affected by what happened that night at Druid River and how it comes to be that they all have something in common and the one thing that they are trying to protect. The novel alternates chapters with each of the characters’ perspectives of then and now. A heart wrenching novel whereas I was so engrossed it felt that I was transported into the storyline. Each and every character relatable. The suspense was constant but on many different levels and for different reasons (do not want to include spoilers). The ending was shocking. This is the first book I ever read by this author but she is definitely going on my tbr author list. This book looks awesome! I'm going to have to grab it!! That sounds like a thriller I would probably enjoy. I will have to put it on my TBR list. Nice review, thanks for sharing. Glad this one was great! Whenever an author's debut book is fantastic I always wonder what the next one will be like. Looking forward to reading it. I like the sound of this a lot; nice review Cheryl. It seems that everyone loves this book! I've got to get my hands on a copy. I'm so glad you liked it! I gave it five stars too….. I loved her debut and only liked this one but all of you are loving it, which of course is great. 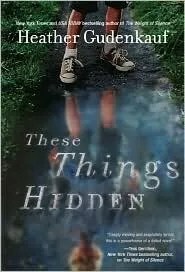 These things Hidden is on my TBR! I want to read it soon. Thanks for the fantastic review!